Printers have a reputation for being fiddly things to set up, but in Windows 10 it’s actually very easy to get your printer up and running. 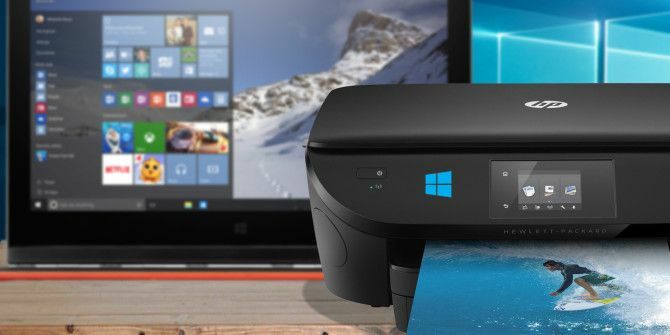 We’ll guide you through the different methods you can use to get Windows 10 to detect and connect to your printer. While these instructions are written with Windows 10 in mind, you will find that the process is pretty similar for most modern versions of Windows, it’s just that the process has been integrated into the new Settings panel How to Control Windows 10: The Settings Guide How to Control Windows 10: The Settings Guide The Windows control panel is on its way out. Its replacement, the Settings app, has received a significant upgrade in Windows 10. We'll reveal all its secrets for you. Read More in Microsoft’s latest operating system. If you have your own advice to share on setting up a printer in Windows 10, please let us know in the comments below. First thing’s first: connecting your printer. Each device will vary, so it’s always best to follow manufacturer instructions. If you’re not interested in a network connection, simply plug the cable from the printer into your system. However, the majority of modern printers will allow you to connect to your network using WiFi or Ethernet. Connecting directly to the network is the easiest way to get set up if you’re looking to share the printer across systems, so if your model offers this then take advantage of it. If that’s not possible then you should use Homegroup in order to share your devices with other trusted systems on your network. Do a system search for homegroup and select the relevant result. Click Change advanced sharing settings… and select Turn on file and printer sharing. The Homegroup screen you’ll see will depend on whether or not there’s already an existing Homegroup on the network. Click Create a homegroup or Join now, depending on your situation. Then follow the wizard through. On the step where you’re choosing what to share, ensure that Printers & Devices are set to Shared. For more information on Homegroups, check out our guide to home networking between user accounts Home Network Tip: How to Share Files & Folders Between Windows User Accounts Home Network Tip: How to Share Files & Folders Between Windows User Accounts Sometimes computer can be physically very close together, but seem miles apart when you try transfer a file. Use this guide to help you fling files from PC to PC with the greatest of ease. Read More . Press Windows key + I to open Settings and navigate to Devices > Printers & scanners. Here you will see a list of all currently connected devices How to Give Apps Access to Trusted Devices in Windows 10 How to Give Apps Access to Trusted Devices in Windows 10 Windows 10 adds all your external hardware to a Trusted Devices list. Here's how to review which apps can access those. Read More . To add a new printer, click Add a printer or scanner. It will then scan for any printers that it can automatically detect. If the desired printer appears in the list, select it and click Add device. Windows will now install the printer, taking care of things like the drivers and settings. And that’s it! Really simple. If, however, your printer didn’t appear on the list, click The printer that I want isn’t listed. This will open a new window with different options to select. As a first port of call, try both My printer is a little older. Help me find it. and Add a Bluetooth, wireless or network discoverable printer. These will supposedly perform a more thorough scan, though your mileage on how successful they are will vary. Nevertheless, the only thing you have to do is wait while it scans, so it’s worth a shot. If you know the exact name of the printer, click Select a shared printer by name and either input the name into the text field or click Browse… to find it within Explorer. Still no luck? Keep reading and we’ll explore the slightly more complicated option of using an IP address How to View & Change Your IP Address in Windows 7, 8, and 10 How to View & Change Your IP Address in Windows 7, 8, and 10 You can use your computer without even knowing your own IP address, but would you like to know how to check? Here's how to quickly check or change your IP address in Windows. Read More . If you know the IP address for your printer then selecting Add a printer using a TCP/IP address or hostname is a good choice. Your printer should have the ability to tell you its IP address, though the method for getting this will vary on the model. Refer to the manufacturer’s instructions, but if there’s a display on the printer, you should find it on a settings or network section. Select the option on your system and then click Next. Keep Device type to Autodetect and fill in the Hostname or IP address and Port name. Ensure that Query the printer and automatically select the driver to use is ticked. Click Next. You should see a screen to tell you that you’ve successfully added your printer. Change the Printer name, if you wish, click Next, decide whether you want to Set as the default printer, then click Finish. Now that you’ve added your printer it’s time to adjust the settings to your liking. Select the printer from the Printers & scanners list and click Manage. If you want the device to be automatically selected when printing, click Set as default. Click Printer properties if you want to do things like change the name of the printer, see its features, and do more advanced things like limiting the time it can be used. Click Printing preferences if you want to specify the type of paper you’re using, the printing quality, whether to print on both sides, and more. Some features will be limited depending on the model of your printer. Hopefully, this guide has successfully walked you through the simple steps of setting up your printer. While printing in the home might not be as popular nowadays, thanks to the ease of online sharing How to Redirect Windows 10 User Folders to Cloud Storage How to Redirect Windows 10 User Folders to Cloud Storage Windows 10 includes shortcuts to your default folders, but you can easily move these to cloud storage to ensure they're backed up. Read More , it’s always handy to have one around. If you’re still having trouble connecting your printer, check out our troubleshooting tips when installing a wireless printer How To Install A Wireless Printer On Windows & Workarounds How To Install A Wireless Printer On Windows & Workarounds Having problems connecting to your wireless printer or looking for a way to make a cabled printer accessible wirelessly? Use these tips and tricks to achieve wireless printing Zen. Read More . And then be sure to check out our guide on how to save printer ink How To Save Printer Ink & Make It Last Longer How To Save Printer Ink & Make It Last Longer Read More , which will be sure to save you money. Did you run into any problems during this process? Do you have your own tips to share on setting up a printer in Windows 10? Explore more about: Printing, Windows 10. I had no problem connecting my printer however now when I try to use it I'm told that it is OFFLINE. I go to my MAC and print from the same printer. How can I get Windows 10 to continually connect from Windows 10?